To celebrate the Brighton Fringe Festival a transformation will take place at Corridor Gallery! The gallery’s unique red corridor will transport you into a new world, becoming a gateway to the mythical universe of ‘The Cloud Top Archipelago”. A sublime experience awaits within, through this immersive exhibition, shaped and guided by the talent and imagination of Aaron Howdle. “The Cloud Top Archipelago” is the product of Aaron’s rich imagination, fuelled by a childhood lost in fantasy and science fiction, and culminating in a painstakingly crafted, richly detailed fictional world. 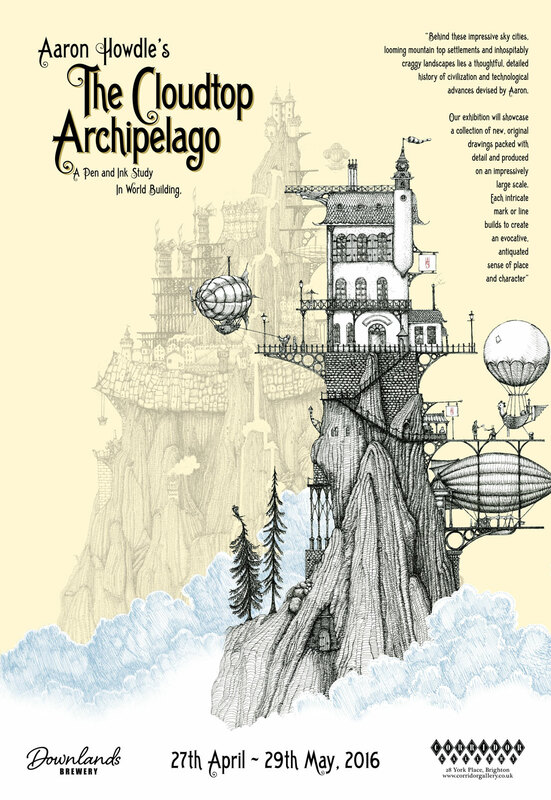 This exhibition is a milestone on the road to the much anticipated launch of The Cloudtop Archipelago book this autumn, offering further explorations into this enthralling fantasy world. The exhibition will showcase a collection of new, original drawings, packed with detail and rendered on an impressively large scale. Each intricate mark or line builds to create an evocative, antiquated sense of place and character. Absorb majestic mountain-top landscapes, shown from the perspective of a passing bird or mechanical airship. Immerse yourself in bustling cityscapes where every mark denotes life. Each drawing brims with stories, people and movement, inviting you to lose yourself in the lifeblood of this richly imagined world. Behind these impressive sky cities, looming mountain top settlements and inhospitably craggy landscapes lies a thoughtful, detailed history of civilization and technological advances devised by Aaron. Aaron’s experience in a wide range of creative work from engineering, product design and model making to graphic design and illustration, breathe life into the world of The Cloud Top Archipelago and the technology and design this universe relies upon. A self-referential inventor character pops up in many of the fables Aaron has woven into his stunning ink drawings. The machines reinvented and explored in The Cloud Top Archipelago focus on pre-electrical and pre-combustion technology. Aaron’s eye for detail and arcane engineering, feed into the imagined technological elements of the universe he has created; blurring boundaries between technical drawing, art and fantasy to create an array of fantastical technologies from steam-powered wild boars to an armada of weird and wonderful flying machines. Aaron Howdle’s drawings consistently engage and enthral viewers; beyond his impressive, often wizardly skills with pen and ink his ability to captivate and inspire through invention and imagination connects the viewer to a powerful childhood sense of wonder. Aaron’s over-active imagination has evolved beyond simply playing or daydreaming into a fully realised, fully formed and thriving universe. This entry was posted on April 17, 2016 by mptask in April 2016, Brighton, Corridor Gallery, May 2016 and tagged Aaron Howdle, art, art exhibition, brighton, Corridor Gallery, ink drawing, pen & ink.